We haven't heard from Norway's Guardians of Time since 2004. They return in fine form with A Beautiful Atrocity, a mammoth platter of progressive power metal and, quite possibly, their best work since their beginnings in 1997. To start, I'm wondering if A Beautiful Atrocity is to be considered a concept album. Unfortunately, I have no information to confirm my suspicion. We're introduced in the beginning to a fellow, Jeffery Callahan, moments from execution and, then, at the end, he meets his demise. 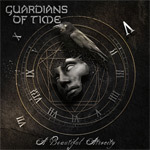 From Altered in Red to the end, Guardians of Time is in exceptional form, their music rising on the collective creativity of composition and musicianship. This well-crafted, well developed, melodic heavy metal with the strong spices of power and progressive metal. Mind Divided, Heart of Darkness, and Dreamworld Messiah are ripping numbers with an ingenious sense of catch accessibility. The depth of vocalist Bernt Fjellestad skill shines on Sleep Eternal. Overall, there's diversity to A Beautiful Atrocity. Powerful heavy metal reigns on I, Sinner and Monster; melodic prog metal ala Queensryche on Dreamworld Messiah and Only in a Dream; and, a strange brew of old school rock and metal with curious backing vocals on the bonus track, The Man. Guardian of Time's A Beautiful Atrocity is genuinely intriguing and entertaining. After seven years to create, one would expect a band bring some significant material. GoT has done it indeed; A Beautiful Atrocity is an excellent accomplishment. Very recommended. Guardian of Time's A Beautiful Atrocity is genuinely intriguing and entertaining. After seven years to create, one would expect a band bring some significant material. GoT has done it indeed; A Beautiful Atrocity is an excellent accomplishment.